Ms Rhoda Karl tested out some of her new skills learned at the training program. A group of Papua New Guinea’s public servants have boosted their leadership skills, ensuring they have the tools to communicate effectively with peers and the public. 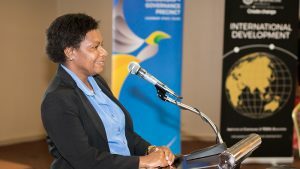 More than 40 public servants from throughout Papua New Guinea participated in the Pacific Leadership and Governance Precinct’s Public Speaking and Speech Writing course, held in Port Moresby. 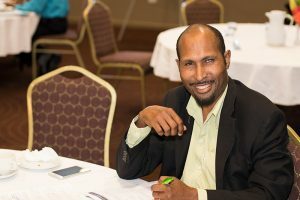 The intensive course was tailored to the Papua New Guinean public sector, and focused on creating the right tone to motivate and inspire others. Assistant Secretary Rhoda Karl, from the Department of Treasury, said her role involved the preparation of departmental and ministerial speeches. “I have gained confidence in preparing speeches, and for public speaking and presenting myself,” Ms Karl said. Mr Xavier Bate Winnia, from the Constitutional and Law Reform Commission, wrote a speech for presentation on the final day. Xavier Bate Winnia, Senior Research Officer at the Constitutional and Law Reform Commission, said he now has a greater understanding of how to make an impact with his ideas. “In my line of work, as a researcher, we are used to providing a lot of information – but it can be too much to take in,” Mr Winnia said. The Public Speaking and Speech Writing course was led by Toby Ralph, one of Australia’s eminent communications experts and speech writers. He said public speaking and speech writing are important skills that can be trained and improved. “To communicate ideas crisply and carry people with you matters when you’re at the pointy end of the public service,” Mr Ralph said. The Pacific Leadership and Governance Precinct is a joint initiative of the Governments of Papua New Guinea and Australia to support ethical and capable public sector leadership. Precinct courses respond to demand for skills and knowledge that are pertinent to existing and emerging public sector leaders.